Sam Laber is the Director of Marketing at Datanyze. How many companies are using Marketo vs HubSpot vs Pardot. Which mobile gaming apps use Crashlytics. How many companies in Europe started using an e-commerce platform this week. 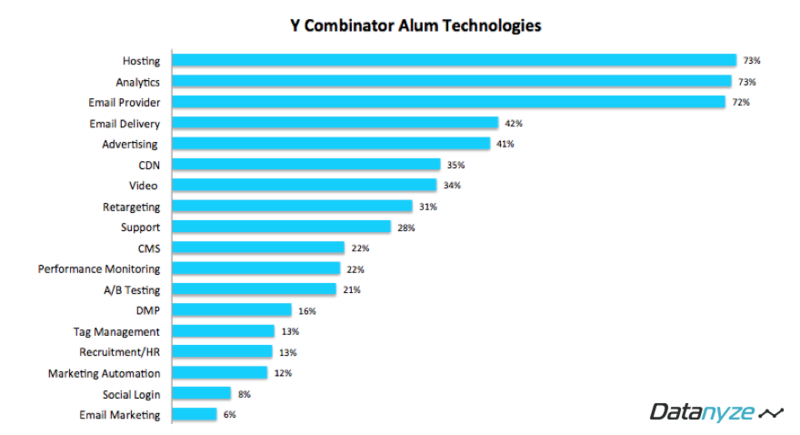 We thought it would be interesting to look under the hood of 638 YC companies to see which technologies are most prevalent. 1. Of the YC companies that use third party email, 97% use Gmail and 2% use Outlook. 2. Of the YC companies that use hosting providers, 55% use AWS, 13% use Cloudflare and 6% use Rackspace. 3. Of the YC companies that use a CDN, 68% use Amazon CloudFront, 7% use Cloudflare and 5% use Fastly. 4. Used by 172 YC companies, Facebook Custom Audiences is the most popular AdTech solution. Twitter and Yahoo Ads tie for second with 146 sites, while AdWords comes in third with 130. Only 10 sites are advertising on LinkedIn. 5. 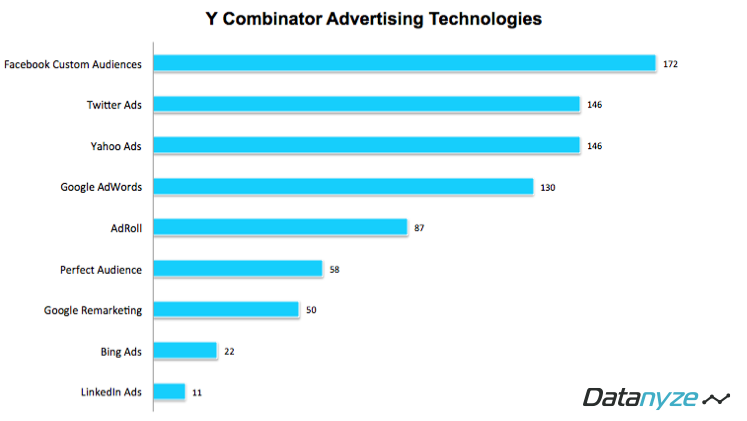 41% of YC companies use Advertising Solutions and 31% use Retargeting. 6. Only 21% of YC companies are A/B testing, but 93% use Optimizely. 7. Greenhouse.io and Lever are the most commonly used Recruitment Software, used by 35 and 34 YC sites respectively. 8. Only 22% of YC sites use a third party CMS. Of those, 83% use WordPress. 9. Zendesk and Intercom lead Customer Support software with 42% and 40% respective market share. 10. Only 12% of YC companies use Marketing Automation; of those, 42% use HubSpot and 37% use Marketo. 11. In terms of installs, the most common Analytics providers are Google Analytics (451), Google Universal Analytics (314), Mixpanel (183) and Optimizely (129). 12. Google vs Microsoft: 130 YC sites advertise on AdWords, while 22 use Bing. 13. 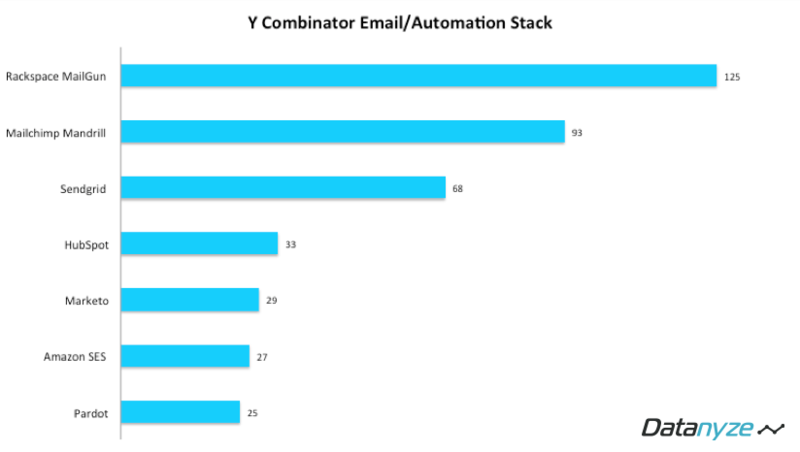 What solutions do YC companies use to send emails? Most installed are Rackspace (125), Mandrill (93) and SendGrid (68). 14. Used by 70% of YC companies, Google Analytics is the most popular overall technology. 15. The 5 most common technologies are Google Analytics (445), Gmail (443), AWS (255), Mixpanel (174) and Facebook Custom Audiences (171). 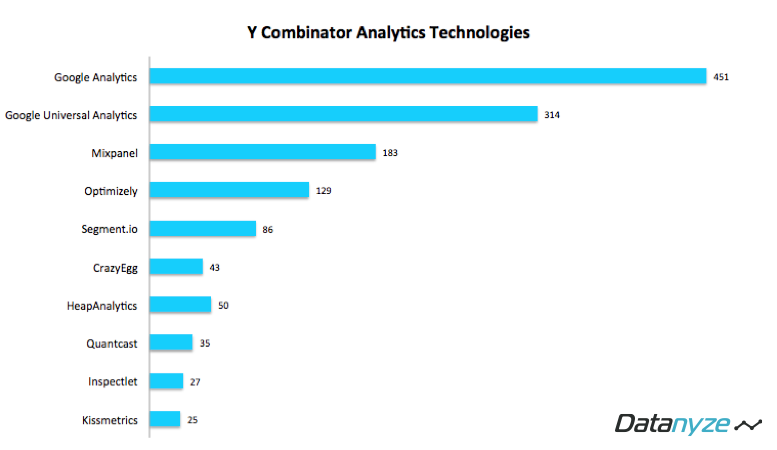 For the bar graphs, the x-axis represents the number of YC websites using each technology. 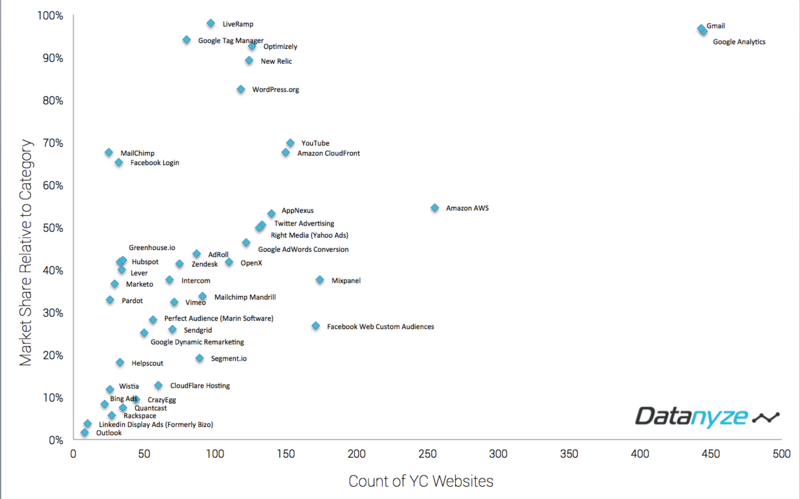 For the scatter plot, the x-axis is YC websites and the y-axis represents the technology's market share relative to their technology category. For example, MailChimp (top left) has a relatively low count, but a high market share within email marketing. You can talk to Sam on Twitter @SLaber89.